On Friday 25th May 2018, one hundred cars costing less than £500 each left from Blenheim Palace in Oxfordshire heading to Le Touquet in northern France on the Twin Town Challenge 2018. Over the Spring Bank Holiday weekend, the teams completed a number of fun points based challenges to raise money for Charlbury-based charity SpecialEffect. Jody Fletcher, Managing Director of Chilli Promotional Products, says “We’re delighted to have taken part in this event, which was great fun while raising a huge amount of money for a really fantastic charity”. The Chilli Promotional Products team, The Gold Members, is inspired by the film Austin Powers and the car looks “groovy baby”!! The team consists of Jody Fletcher of Chilli Promotional Products Ltd, Andy Reynolds of AJR Electrical (Banbury) Ltd, Fiona Reynolds of newly incorporate Far Reach Recruitment in Banbury and Lily Willcocks from Peter Ball & Co. The Chilli team has raised more than £2,400 so far with sponsorship from local businesses, donations and raffle ticket sales and the total is still rising! If you’d like to help The Gold Members soar past their target of £2,500, please head over to https://www.justgiving.com/fundraising/chillipromotionalproductsttc18 to make a donation! 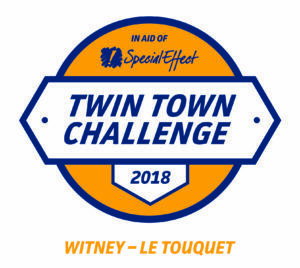 The Twin Town Challenge is organised by Brendon Cross, who is MD of STL Communications and a SpecialEffect Vice President. All the costs of the event have been covered by sponsorship, which means that every pound paid in entry fees as well as the fundraising by the teams goes straight to the charity.